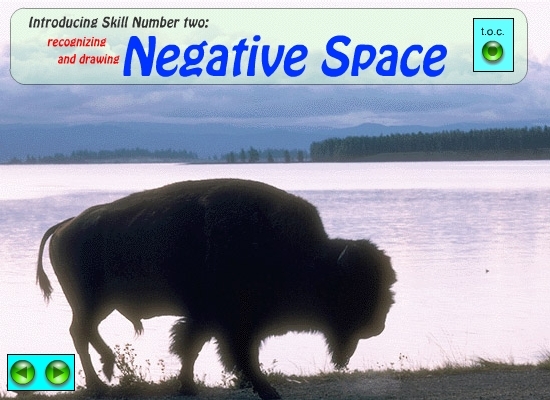 What's negative space drawing? It might make more sense if we talk about "positive forms" first. A positive form is the actual thing you're drawing. You could be drawing a hand, a boat, a string sculpture, a person. It doesn't matter. Positive forms are usually things we have names for. We can put our hands on them. Note: Due to the way the Flash Lessons are constructed and due to limitations within Flash technology itself, the links contained within the interactive lesson point to the online book (links of the "http://www...." type). All the same pages those links aimed at are within the book in front of you. Make sure you employ the techniques you're learning in the "Flash Interactive" lessons. These skills will really come into play when you start drawing faces, caricatures and, well anything! I'll happily post (forever and include in the book), any of your negative space drawings of any of the pictures here. (contact me through email). So have at it!